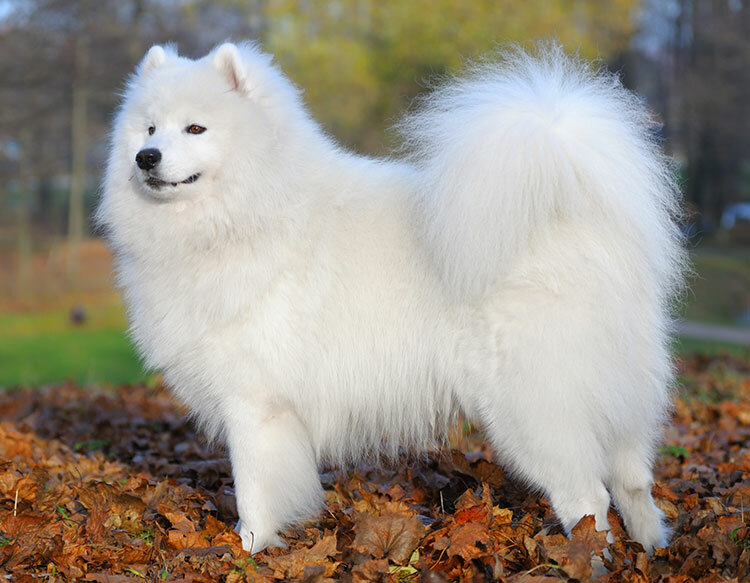 Probably the most easily recognised of the northern spitz breeds, there is a good reason why the Samoyed is often known as ‘the smiling dog’. The dark eyes, nose, and lips of the Sammy make him look like he is always smiling, and it’s hard not to do the same when you look at this endlessly appealing dog. This is an ancient breed that was often used for sledge pulling, as well as for the main activity of reindeer herding. Always cheery, it is impossible not to be happy around a Samoyed! Lovely towards children, excellent watchdog but is so people orientated they are more likely to lick a burglar rather than bite! This is a friendly, intelligent breed that makes a great companion. However, the Sammy is independent, easily bored, and is, at best, often casually or intermittently obedient! Doing what their owners want is looked on as an optional extra to these highly intelligent dogs. While the Samoyed may frequently look on obedience to their owners as an inconvenience, their desire for close social contact with them is legendary — hence why their sometimes exasperated owners are totally devoted to them. Generally a healthy dog with few breed specific problems. White hairs everywhere! The profuse coat keeps him warm in winters and cool in the summer, although the heat does still affect them. Also, be careful off the lead. They are better than most sled-type dogs but make sure you are certain they'll come back to you. When early explorers to the Arctic first spotted the Samoyed, they noted that his owners were wearing heavy clothes made from dog fur, and so it appeared that, from time to time, the dogs were killed to provide pelts to keep the local population alive in the frozen wastelands. At the end of the 19th century, explorers brought back a handful of dogs to England where they quickly became popular, and it is estimated that all the modern Samoyeds are descended from these 12 dogs. One of these dogs, Antarctic Buck, was a survivor of the second Scott expedition to the South Pole, and ended up in a zoo in Sidney, Australia. When news of this became known, he was shipped back to the UK to join the foundation stock.